back corner of the workshop. I climb up onto the workshop roof with my 300mm lens and stand about six feet from the lower branchs of the tree, waiting for the warblers to come close. Eventually they do; I've snapped close to five hundred pictures over the past week though most of them weren't worth keeping. It's tough to get clear views of the birds gleaning among the leaves. The cedar in front of the house makes a better backdrop; I've been able to get a few photos from the garage roof, including the first two displayed here. In addition to the butterbutts, over the past month from the same vantage point I've managed to get closeups of ruby-crowned and golden-crowned kinglets, black-capped and chestnut-backed chickadees, bushtits, brown creepers, cedar waxwings, downy woodpeckers, a red-breasted sapsucker, a Steller's Jay, and orange-crowned, yellow, black-throated gray and Nashville warblers. The first wave of warblers, all but the yellow-rumps, came through around the 10th of September. 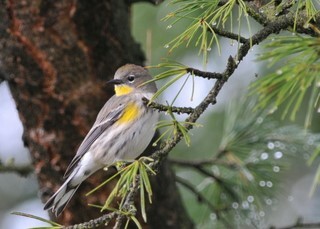 There may have been earlier migrants, in particular the Wilson's warblers, but if so I missed them. After a lull around the middle of September the yellow-rumped warblers, which had been numerous in the mountains during my Chikamin Ridge hike, showed up here in the lowlands as well. I considered trying to squeeze in one more backpack trip during the long period of mostly sunny and dry weather after the first of October but the deck needed painting and I wasn't quite up to more time alone in the woods so after Susan and I got the deck mostly done I took off with Pat to Red Top instead. I hadn't been there in a couple of years and after a day and a half of digging I remembered why - the eggs are never as numerous in reality as they are in memory. That and I already have plenty of them in piles around the workshop. It's still a thrill though when one of those round agate modules rolls out of the rusty soil as you pick away at the wall of your hole. The road hadn't been graded since my last visit; some sections are studded with rough rocks, passable but slow. I found Pat's camper still cooling down at the trailhead parking area when I arrived mid-afternoon, having been delayed by a meeting with a retirement planner who told me that if I continued with my plan of working just part of each year, we'd probably still be OK financially. That was welcome news. Pat is already retired; I've had the summer off but am anticipating going back to contract work next month. Gus found me as I approached the digging area down in the woods north of the lookout. Pat was already deep in a hole, only his head and shoulders showing above ground with a big pile of rocks and dusty soil behind him. He hadn't found much yet but had cleared out an area a couple feet across and four feet deep. I set to work clearing out a hole just uphill from his, a promising spot with a wide exposed bank to work at. By the time we quit for the day we'd worked about three hours and I had several good-sized eggs and a handful of smaller ones. Pat, demonstrating once again his remarkable knack for picking good holes, had about twice as many eggs as I did. Overnight the temperature dropped into the mid-20's. We both stayed in Pat's camper, appreciating the lights and the propane heater. For supper I steamed fresh corn along with potatoes and carrots, all from Pat's garden. Lacking butter for the corn we used some Brie cheese I'd brought for lunch instead. Pat, who'd never tasted Brie before, decided it made a pretty good butter substitute. After supper we sat at the table in the dim light of the 12-volt lamp overhead and talked some, about rock saws and vegetable gardens and how there were alot of yellowjackets around Pat's place this year. Friday we woke up at sunrise and were digging by 9AM. The weather stayed overcast until late afternoon and cold enough that the only way to keep my fingers warm was to keep digging. After lunch I had to swing my arms around like a windmill to thaw them out again. It didn't feel like I was finding much, especially when every 15 minutes or so Pat would hold up another big round agate nodule for me to admire. I kept at my hole most of the morning but after an hour of not finding anything I moved uphill fifty feet or so to another hole. I felt better when after just a few minutes of clearing out the hole, I scraped loose a nice 5-inch egg. I didn't find much else there after that though. Around mid-afternoon Pat heard voices down in the woods below us. When we hiked down to investigate we found two old guys (like us) and a young man digging in an area with quite a few other holes around. The soil was softer with fewer chunks of the rough basalt host rock than where we were working, but though the digging was easier they only had about half as many eggs as we did, and no big ones. We invited them up to see what we'd found; on the way back up I picked up two nice eggs just sitting on the ground amidst the piles of basalt. They were impressed with Pat's pile, and with good reason; he had close to a five-gallon bucketful. Towards the end of the day I dug some in another hole just below Rock Harn's old hole where he found the 400lb agate. The digging was easy there. I got into an area of loose gravel and though I found only two larger eggs I was scraping out little eggs every couple of minutes, so I had a good time. The sun came out at the end of the day but the breeze was biting. Odd how in mid-winter 27F feels warm but in early October it seems to penetrate whatever you put on. Approaching the car it occurred to me that I could be home with Susan by 8PM but I didn't say anything to Pat. The plan was to spend another night and anyhow, he'd have quite a bit longer drive home than I would. We were quite comfortable again in his camper, with more of Pat's sweet corn for supper and an Ibuprofen for dessert. After breakfast Pat and I packed up quickly and were on our way down the hill by 8:15. The stars had been bright when I'd gotten up at 3AM but the sky was overcast again in the morning with a mid-level altostratus layer thick enough to block the sun. Considering a hike, I jogged up the road to an outlook from which I could see Mt Stuart. The summit was visible though faded somewhat by a thin fog of precipitation but there didn't appear to be any significant new snow, acceptable hiking conditions. I considered heading home via Yakima the way Pat was going, perhaps stopping at Chinook Pass for a hike on the way, but I'd never been to Colchuck Lake and it was just an hour away this morning. Moreover it was Sabbath so even if I went home I wouldn't be finishing up the deck until tomorrow anyhow. If I hiked up to Colchuck Lake I could eat at El Caporal in Cle Ellum on the way back and still be home by 9:30 or so. I started up a little after 10AM. The trailhead parking lot was full; I got the last space. The overcast was developing a little definition, a good sign, and the temperature was a chilly 27F. Other than a sore knot in the left side of my lower back from all the digging the day before I felt good. That's the spot I first aggravated on a snowshoe/snowboard hike some 15 years ago up one of the big open hillsides east of town in Sun Valley on a March morning. The wind out of the higher mountains was kicking up a fierce ground-blizzard on the exposed ridge and it was all I could do to stay upright and keep frostbite at bay. Somewhere up there I wrenched my back but didn't notice it until I thawed out back down at the car. Today it gave a little twinge every time I planted my left foot all the way up to Aasgard Pass but I mostly didn't notice it and it didn't get any worse all day. With a few brief photo stops I made it to the lake by noon. The forest in the valley is mostly lodgepole with evidence of a burn several decades ago. Much of Icicle Creek up to the trailhead burned 7 years ago (the morels we picked out of the ash along the Icicle Creek road the following summer are still bagged up in the downstairs freezer) so I tend to think of big fires in the area as a recent phenomenon, a consequence of warming climate compounded by years of fire suppression, but the prevalence of lodgepole pine throughout the area indicates that fire has been active there for a long time. On the way up to the lake the composition of the forest changes to fir (and spruce?) with limber/whitebark pines mixed in. As they are across the western mountains, many of the pines are dead or dying from insect infestations, facilitated (I think) like the fire by warmer conditions in recent years. Bad news for Clark's Nutcrackers which rely on pine seeds as a staple of their diet. I heard a few on the way down. I noticed very little bird activity on the way up; they seem to lie low on cold overcast mornings. I listened particularly for crossbill calls, having seen white-winged crossbills a few weeks ago at Joe Lake, but I heard none, probably due to the lack of cones on the firs. Where the trail approached the lake I dropped down to the shore. Colchuck Lake is not as attractive as many alpine lakes because the water level fluctuates. A dam at the outlet is the likely culprit. At low water the lake is surrounded by a ten foot high bathtub ring of bleached boulders and barren dirt. The exposed shoreline along the far side of the lake, accessible via a makeshift bridge of driftwood across the outlet channel, appeared to provide a more direct route to the head of the lake than the up and down trail through the woods along the west shore. I went for it, taking a chance that the one section I couldn't see, where a cliff appeared to drop right down to the water, would prove to be passable. It was, though clambering over (and in one spot, under) boulders along the shore was probably slower than hiking the trail would have been. The route mostly on the left. trail scrambles up through a ledgy area. That section was very slippery due to several inches of snow compacted on the tread; I found the going easier off the trail where I could hop from rock to rock. A few hundred feet from the top the wind picked up and it got cold fast. I stopped and put on wind pants (Taku, a steal on sale last month at REI for $50), an extra fleece shirt and my cuddly Monkey Man fleece (on sale at LL Bean two months ago for $100). his extra socks and gave them to the guy with numb hands. My first good deed of the day. 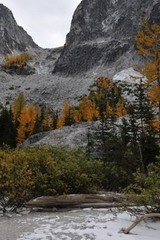 at the base of the summit cliffs. With crampons and an axe I could have traversed across the top of the glacier and probably gained the ridge but that will have to wait for another trip. The descent back to Aasgard Pass took another 40 minutes so I ended up starting down at 4PM, exactly an hour after my planned turnaround time. With photo stops I reached the lake outlet at 5:45 via the trail, a faster route than the rocky shore I'd followed on the way up. 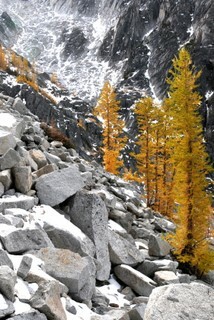 The descent of the snowy section near the top of the pass required considerable care. Other than campers along the lake I saw no-one on the remainder of the descent until I caught up to a young woman and her 5-year old daughter on the Lake Stuart trail while still over a mile from the trailhead. It seemed unlikely that they would make it out before dark so I asked if she had a flashlight. She did not. At the last minute I'd stuck an extra flashlight in my pack, the lightweight solar-powered light I bought at Costco a couple of weeks ago, so I gave that one to her and dug out the LED headlamp for myself. They started down the trail while I repacked my pack and she must have really hustled because it took me quite a while to catch up to her again. By that time it was already getting a little difficult to spot the roots and rocks in the trail. I asked if I could hike with them and that was fine with her. Even with a light I don't particularly like hiking alone after dark, and all the more so since my headlamp batteries were old and gave barely enough light to see the ground. Her daughter talked almost continually to whichever of us would respond so the time passed quickly. The woman takes her daughter out hiking every weekend. She drove all the way from Seattle to hike up to Colchuck Lake but decided on Lake Stuart instead because they started so late. "Not that pretty", she said. According to the daughter Dad builds houses. Also he's brown. I didn't ask why he didn't join them on their hikes. When we reached the trailhead at 7:15 a little light remained in the sky overhead but the woods were completely dark; it would have been very difficult to follow the last half mile of the trail without the flashlight. At the trailhead she gave me back the light, told me how grateful she was and said "God bless you". Too late it occurred to me to respond "He already has", for I too was grateful for their company and for the opportunity to help. Two good deeds in one day. As usual I stopped at El Caporal in Cle Elum for supper. The salsa and chips were tasty; the Burrito Relleno fat and featureless. Next time I'll go back to the Burrito Vegetal, which though similar has perhaps a little more flavor. Yesterday evening I suggested to Eric that we do a hike. He'd mentioned Rainbow Ridge which sounded good to me because I wanted to spend some time in the woods, but this morning he was more interested in Washington. The forecast called for summits in and out of the clouds with not too much wind, decent conditions, so I agreed. The route would depend on how much ice there was; we figured Tuckerman's would be too icy so we chose Boott Spur which kept our options open - we could come back down Boott Spur or cross over to Lion's Head if that looked OK or even go to the summit. We left Pinkham at 9:40AM in the sunshine and hiked steadily up to the flat spot on the Boott Spur ridge with just one stop at the overlook not far below treeline where I took a few photos and we put on clothes - a long-sleeved tech shirt under my slightly damp t-shirt, then a mid-weight tech shirt and my favorite Monkey Man fleece jacket, a fleece cap and fleece gloves. I hadn't been able to find my wind shell when I was packing up this morning so I was a bit underdressed for the wind. Ten minutes later though, we had to strip most of it off again in the sheltered section of trail above Split Rock. 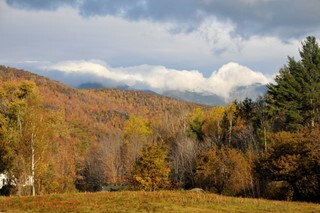 stratus banked up against the summit and the southern peaks. A pretty stiff breeze was blowing from that direction but the clouds were dissipating over the flats between us and the Cone. We lingered in the shelter of Boott Spur for another half hour or so to finish up lunch. amount of rime ice, probably indicating where freezing level had been the night before. The rime ice was melting a bit but still in excellent condition. I could have spent an hour or more photographing the ice formations, feathery-looking spears extending into the wind from every exposed surface. The ice was best right below the summit, where I noticed that for the first time the fog was freezing on my fleece. The buildings and towers at the summit looked very wintry all coated with rime. We made the obligatory 25' pilgrimmage from the parking lot to the official summit, paid a quick visit to the observation deck and took shelter briefly in the Observatory building where a group of orange-coated Observatory volunteers were apparently waiting for a ride down. We didn't stay to talk, lingering only long enough to check the weather board (31F, 32mph wind) before setting out for Pinkham. We set no speed records on the descent. My legs had been tired all day and particularly so on the trek down the Fire Trail. I was glad I'd brought John's hiking poles. Since the hike up Washington with Eric I've been looking for one more opportunity to get out in the mountains before we returned to Seattle, one more sunny day with no obligations. I suggested the ledges on Baldface, one of my favorite hikes, to Eric a couple evenings ago but he didn't want to drive that far. Reluctant to take a whole day alone away from the family, I stayed home and went for a swim with John later in the afternoon instead. Then Saturday was rainy and Sunday was the half marathon so that left only today. Fortunately the weather this morning was perfect. light for gray days and early nights ahead. Recalling successful bird photo outings up on the side of Black Mountain last June and the color lingering a few days ago on the slopes below the Knoll, I decided to hike up the trail behind Overlook. No driving required. John thought he might like to come with me, and then Mom. Figuring Susan could keep up with us I invited her and when Sarah showed up she was interested too. I packed some lunch then ate it while we waited for each other to finish getting ready. Hoping for birds I put on the 300mm lens. John and Sarah and Mom brought hiking poles; years of skiing (or perhaps just their years) have taken a toll on their knees. Mom is scheduled for knee-replacement surgery on both knees a week from today, so this would be her last hike on the joints she was born with. The hike was just what I was looking for. The trail starts out on what was once probably a logging road but is now a grassy path traversing up a gentle wooded slope. 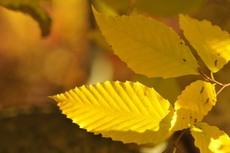 About half the trees were bare; filled with light the forest seemed open and inviting. Part way up, the trail ascends through an area which was logged maybe 15 years ago and has grown up with a dense understory of beech, a flood of yellow in the sunshine. Towards the top the way became quite steep and somewhat difficult to follow, marked by low cairns which were nearly smothered in fallen leaves. It occurred to me that this steep trail slippery with dry leaves was more than Mom and John had bargained for but they managed the irregular rocks and short ledgy sections without much difficulty, and slowly enough that Susan, who is unaccustomed to significant uphill walking, was still able to keep up. I had plenty of time to take photos but the telephoto lens was too long for group shots and I didn't bother to change it out. For birds, I heard only a few chickadees and nuthatches. The trees were more interesting, an open mix of spruce, oak and some of the largest hop-hornbeams I've ever seen. Though not more than 20' tall a couple of them were nearly 18" in diameter, impressive for a tree whose trunk is normally less than 6" thick. The stout trunks and delicately shaggy bark reminded us of old apple trees but the tapered crowns with fine twigs are hard to mistake for anything else. We sat on the ledges for a half hour or so. The view from the Knoll is more constrained every year, obstructed in most directions now by red spruces which were barely more than bushes when I was young. We picked out Sarah's house, and Dean's newly-cleared lot on the ridge of Tin Mountain above the Dundee height-of-land. Dean, who according to Mom and John once threatened to stuff his ex-girlfriend into a freezer than run her through a wood-chipper once she was good and stiff if she persisted in spreading the rumor that he was the father of her increasinly evident unborn child. That was when he was a young man; apparently he's settled down quite a bit since then. The money he's made selling off pieces of the old family farm over the years might have something to do with that transformation. Other than the McMansions scattered through the woods, the area below Black Mountain doesn't look that much different now than it did then. The ski slopes we hiked down this afternoon are pretty much the same as those I learned to ski on almost half a century ago. Susan fixed Shepherd's Pie (both vegetarian and meatitarian versions) and Sarah baked a flourless chocolate cake to celebrate Mom and John's 42nd wedding anniversary, which is tomorrow. Dinner was delectable and Mom and John were touched by our thinking of them. After dinner we posed for a photo on the sofa in the PT room, first Eric and Sarah and I, then Mom and John and the three of us with Susan and Roger. It took half a dozen attempts with the self-timer before we obtained a successful shot. The plane was nearly empty; fewer than 50 passengers were on the Jetblue flight to Seattle. That works out to not even one passenger on each side of the aisle per row. The flight attendants said that this evening's flight was an anomaly; usually the plane is reasonably full. I hope so; I like that flight and would hate to see it cancelled.